To prepare an area for new sod or seed, roto-till EKO Clay Buster into the top 6″ of your soil. Spread grass seed according to instructions on packaging, or lay sod according to instructions provided by supplier. Cover the grass seed with approximately 1/4″ of EKO Lawn Top Dressing, then keep damp until germination occurs. EKO Clay Buster will have the best results when incorporated into the soil, rather than being placed on top of existing turf. Therefore, it is not recommended as a top coating for existing lawns. See EKO Compost or EKO Lawn Top Dressing for best recommended uses with an established lawn. Mix EKO Clay Buster thoroughly into your existing soil at a ratio of 1 part EKO Clay Buster to 2 parts native soil. When planting or transplanting trees and shrubs after the dirt has been removed from the desired planting location, place EKO Clay Buster in the bottom of the hole to a 2” depth. Place your tree or shrub in the prepared area. Mix 1 part EKO Clay Buster with 2 parts native soil and fill in around the root ball of the plant. Apply water to the area around the original root ball. Add more soil mix to fill in any low areas. 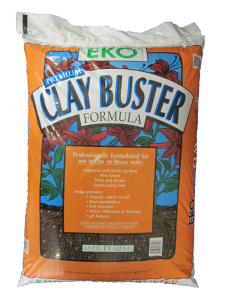 EKO Clay Buster is 100% Organic. It consists of thoroughly cured compost with the benefit of pumice. Products that are only partially decomposed can actually reduce the amount of nitrogen available to your plants, because the micro-organisms will use the nitrogen to finish decomposing the material. EKO Clay Buster uses only virgin wood products for a carbon source. No recycled tree branches are used due to the possibility of pesticide contamination. It will have a consistent mix due to its controlled quality ingredients. Micro-organisms are an important part of the composting process. Micro-organisms convert carbon into energy for their own growth. They recycle the nutrients from decaying material into their own bodies and eventually back into the soil. Your plants use the nutrients stored in the micro-organisms for food, and the process starts over. Pumice is the key ingredient to EKO Clay Buster. Pumice is a rock, that creates porosity in the soil, providing air space to the roots, space for water to reach root zones, as well as providing space for drainage to avoid “drowning” plant roots. The salt content as measured by independent labs is 2.7. This is considered a low salt content according to university standards. High salt content can wither plants resulting in decreased plant growth and a decrease in the general health of the plant. The pH of EKO CLAY BUSTER as measured by independent lab analysis is 7.2. This is considered to be a neutral pH level. High pH is considered to be alkaline, and low pH is considered to be acidic. If the pH of your soil is out of balance, it can decrease the growth of your plant and can negatively affect the absorption of nutrients by plants.